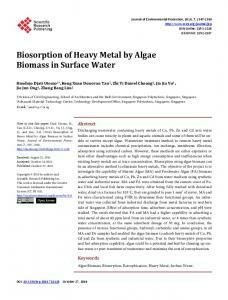 adsorption of copper metal on living biomass of Aspergillus niger was investigated. 100 mg .... 50 ml of 10ppm solution of copper was taken in each of a set of 6 flasks. Similarly ..... textile dyes from aqueous solutions by dead fungal biomass. Oct 27, 2016 - lion tonnes of aquatic organisms from rivers in Bishan-Ang Mo Kio, Sungei ... As an island surrounded by sea, Singapore's algae habitats are. Sep 30, 2017 - 1Department of Biochemistry, Government College Women University, Faisalabad-38000, Pakistan, ...... In outlines of biochemistry. 287-. 298. Feb 26, 1976 - L-phenylalanine: 2-oxoglutaric acid aminotransferase initiated the ... cinnamic acid and to phenylpyruvic acid (10, ...... gentisic acid as well. Hanafiah, 2008) and therefore critical in the design of remediation strategies. In this study, Cr(VI) ions uptake ability of the dried powdered biomass of T. harzianum was assessed from the aqueous solution. FTIR spectroscopy of the fungal biomass was performed to assess the functionality of different metal binding sites. Role of key parameters i.e. pH and initial metal ions concentration were studied along with Langmuir and Freundlich assessments. 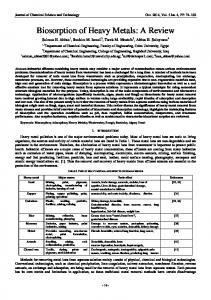 Reversibility of the sorption reaction through desorption process with different acids were also evaluated. V= volume of solution; W= weight of biosorbent FTIR analysis: Sample for FTIR, prepared by the method defined by Patty and Feist (2001). By using hexachlorobutadiene and chlorofluorocarbon oils as complementary mulling agents spectra of the biosorbent were studied prior to and after Cr(VI) adsorption. Data evaluation: The amount of Cr(VI) ions accumulated by the fungal adsorbent and efficiency of biosorption was estimated through following equations (Holan and Volesky, 1994). 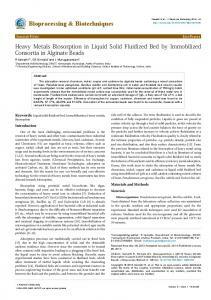 MATERIALS AND METHODS Metal: High purity chemicals (MERCK) were utilized in recent investigation. pH of each experiment was adjusted using either NaOH or HCl. To prepare 1000 mg/L of Cr(VI) solution (stock solution), calculated amount of K2Cr2O7 (Merck Germany) was added in one liter of double distilled water. Subsequent dilutions of 20, 40, 60 and 100 mg/L were prepared by suitably diluting stock solution with double distilled water. Ci = initial metallic ion concentration (mg/L); Cf = final metallic ion concentration (mg/L); m = dried mass of the biosorbent (g); V = volume of solution (mL). Isotherms constitute the equilibrium relationship between metal uptake by adsorbent and the final metal ions concentration in the aqueous solution. Langmuir (1916) and Freundlich (1906), adsorption isotherm models were applied to acquired investigational data during varied concentration of metal ions. 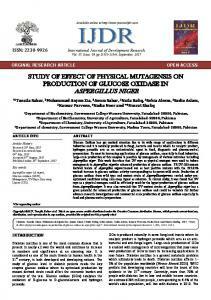 Adsorbent: T. harzianum-FCBP 0139 culture was acquired from the First Fungal Culture Bank of Pakistan, Institute of Agricultural Sciences, University of the Punjab, Lahore. Pakistan. Fungal biomass was prepared on 2% malt extract and was separated from the media after 7th day of incubation. Collected fungal biomass was rinsed with double distilled water, dried at 60 oC in oven and powdered prior to utilization. Where, qeq= metallic ions adsorbed per unit of weight of adsorbents at equilibrium (mg/g); qmax=maximum possible amount of metallic ions adsorbed per unit of weight of adsorbents (mg/g); b= constant related to the affinity of binding sites for metal ions (L/mg); Ceq= equilibrium concentration (mg/L); KF= Freundlich characteristic constant of the system, incorporating parameters affecting the adsorption process, such as adsorption capacity; n = Freundlich characteristic constant of the system represents the adsorption intensity. Data regarding various parameters were analyzed through Duncan’s Multiple Range Test (P ≤ 0.05) to separate mean differences (Steel et al., 1997). 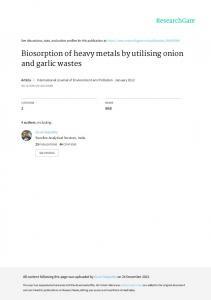 Batch Experiments: Metal removal capacity of the powered biomass of T. harzianum was evaluated by taking 0.1 g of adsorbent in 100 mL of 25 mg/L of metal solution at pH 4 in an orbital shaker at 150 rpm for 3 hours in 250 mL Erlenmeyer flasks (Shoaib et al., 2012). By keeping pH 4 and temperature constant (25°C), the influence of initial metal ion concentration was investigated over the range of 20, 60…..100 mg/L. pH assessment trials were performed at values of 2, 4, ….10 at the similar metal concentration as mentioned above. After each trial, biomass was filtered and filtrate was analyzed for remaining metal concentration on Atomic absorption spectrophotometer for determination of residual metal ions in the aqueous phase. to N-acetyl glucosamine (polymer of the protein peptide bond) manifested significant variation after metal treatment. Likewise, NH of amide-II at finger print region in raw biomass (1547 cm-1) likely supported in electrostatic bindings with negatively charged chromate ions as evidenced by band shifting to low wave number (1516 cm-1) in metal treated biomass. Band at 1371 cm-1 revealed the presence of amide-III or sulfamide band. Vibrational shifting of several other functional groups like: C-C, C-O, C-O-P and C-O-C stretching vibrations of polysaccharides at 1234, 1150 and 1020 cm-1 to various modes of higher and low stretching frequencies indicated their contribution in Cr(VI) binding onto metal loaded biomass. The bands at < 1000 cm-1 correspond to finger print zone of phosphate and sulphur groups. Fig. I: Comparison of Infra red spectra of raw (A) and Cr(VI)-loaded (B) biomass of T. harzianum. Influence of metal ion concentrations: When Cr(VI) ions concentration was raised from 20, 40…..100 mg/L, adsorption efficiency was significantly dropped from 70% to 50% and adsorption capacity was significantly increased from 14 mg/g to 49 mg/g (Fig. II). Occurrence of more unoccupied surface binding sites on the adsorbent at low concentration of metal ions could possibly be responsible for higher adsorption efficiency. 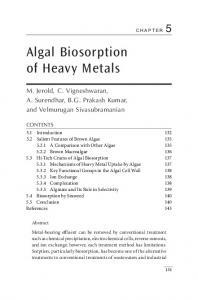 Whereas, on increasing metal concentration equilibrium between metal ions and adsorbent’s active site probably established very soon thus efficiency decreased due to competitive effect of metal ions for adsorption site. While, adsorption capacity was significantly increased with rising Cr(VI) concentration in the aqueous phase, it could be due to utilization of all active functional groups accessible for the adsorption even at higher metal concentration (Shoaib et al., 2012). Fig. 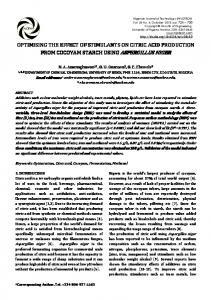 II: Influence of Cr(VI) concentrations on adsorption efficiency and capacity of the T. harzianum. Different letters show significant difference (P≤ 0.05) as determined by Duncan’s Multiple Range Test. Langmuir and Freundlich isotherms: The adsorption of hexavalent chromium onto biomass was studied in the light of Langmuir (1916) and Freundlich isotherm (1906). The R2 (> 0.99) and b (> 0.05) values determined from the Langmuir isotherm showed that the experimental data confirmed well to model (Table I). 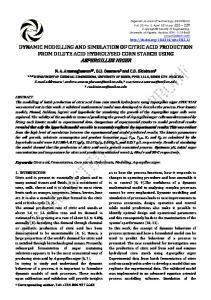 Adsorption capacity of 50 mg/g was calculated from the Langumir plot is very close to experimental value. Whereas, the stability complex “b” formed between adsorbents cell wall and metals ions under specific experimental conditions clearly satisfied the small value i.e., 0.05 mg/L. Ho (2006) related the Langmuir equation with the coverage of adsorbate on a solid surface to concentration of a medium above the solid surface at a constant temperature. Mulgund et al. (2011) elucidated the interactions between adsorbing ion per binding site and homogeneous surface of the biosorbent comprises of only one type of binding site. The Freundlich expression is an experiential equation based on heterogeneous surfaces. Presently, the value of R2 : 0.97 exhibited the suitability of Freundlich model on the experimental data. The value of n (greater than 1) is accomplishing the condition for favorable adsorption and KF: 0.64 showed easy separations of metal ions from the aqueous medium (Table I). The experimental equilibrium data fitted well to both models with correlation coefficient values greater than 0.9 as reported in a related work (Kehinde et al., 2008). Thus, the Langmuir and Freundlich isotherms endow with a flexible logical scaffold for adsorption mechanisms. Isotherm uses a single value to describe maximum adsorption capacity and does not require fitted adsorption capacity values at diverse pH values (Jeppu and Clement, 2012). surface. When pH increased the whole charge on the adsorbent surface turned into negative and deprotonated carboxylate reduced adsorption efficiency of the fungal biomass. Furthermore, solution chemistry of Cr(VI) ions may affect the biosorption process. Previous investigation of Mohan and Pittma (2006) showed that Cr displayed different types of pH dependent equilibria in the solutions. Biosorbate and Cr found to form stable complexes such as Cr2O7 2−, CrO42−, HCrO4 and HCr2O7−, the fraction of any particular species is truly dependent on the pH and concentration of the chromium. Fig. III: Influence of pH on removal of Cr(VI) ions by T. harzianum. Different letters show significant difference (P≤ 0.05) as determined by Duncan’s Multiple Range Test. Desorption: Desorption experiments were performed on the general assumption that restoration of adsorbent prop up the economic of adsorption treatment plant. Adsorption-desorption trial with biomass of T. harzianum exhibited adsorption capacity (q) of 16.33 mg/g from 25 mg/L of metal solution. When this metal-loaded biomass was treated with different desorbing agents, a maximum desorption of Cr(VI) was achieved with 0.1M HNO3 (qdes: 11.5 mg/g) followed by 0.5M HNO3 (11.4 mg/g), 0.1M HNO3 (9.5 mg/g), 0.1M HCl (9.3 mg/g), 0.5M HCl(9 mg/g), 0.1M H2SO4 (8.1 mg/g), 0.1M CH3COOH (8 mg/g), 0.5M CH3COOH (7.5 mg/g) and 0.5 M H2SO4 (6.1 mg/g) (Fig. IV ). Mineral acids like nitric acid and hydrochloric acid seemed to be the most practicably applicable eluting agents. 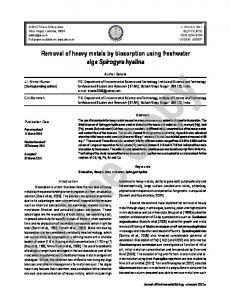 Probably a new low-pH equilibrium attained in desorption system during weak acidity that could possibly prevented the arrant elution and discharge of the adsorbate metal ions into the solution. It has been stated that the comparatively small individual metal affinity differences did not play any role when the concentration of protons is very high, the protons just actually embroiled the metals away from the sorbent (Diniz and Volesky, 2006). Fig. IV: Ability of different acids to desorp Cr(VI). Different letters show significant difference (P≤ 0.05) as determined by Duncan’s Multiple Range Test. CONCLUSIONS: Biomass of T. harzianum exhibited considerable potential to uptake Cr(VI) ions from the aqueous solution. FTIR spectroscopy revealed key role of amine of chitin and chitosan of fungal cell wall in metal binding. On increasing metal concentration form 20-100 mg/L, the adsortion efficiency decreased and capacity increased. The well-fitted isotherms viz., Langumir and Freundlich explained that chromium adsorption is favorable for T. harzianum biomass. Adsorption/desorption trials showed that Cr(VI) can be effectively desorbed from the fungal biomass using nitric acid. 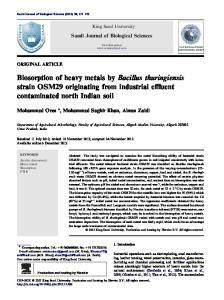 Thus study proposes T. harzianum as a prospective and economic adsorbent that can be utilize for the treatment of chromium loaded wastewater. Films as the Method of Choice in Teaching Laboratories. J. Chem. Edu., 78: 351. Rajender, K., R. Bishoni and B. Kiran (2008). Biosorption of Cr(VI) from aqueous solution and electroplating wastewater using fungal biomass. J. Chem. Educ., 135: 202-208. 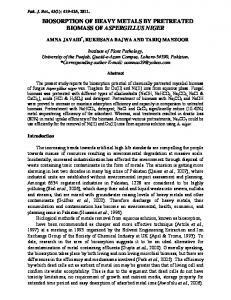 Shoaib, A., A. Naureen, F. Tanveer and N. Aslam (2012). Removal of Ni(II) ions through Filamentous Fungi. Int. J. Agri. Biol., 14: 831-833. 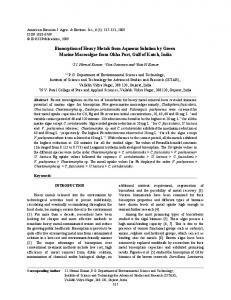 Sivaprakash, A., R. Aravindhan, J. Raghavarao and B. Unninair (2009). Kinetics and equilibrium studies on the biosorption of hexavalent chromium from aqueous solutions. Appl. Ecol. Environ. Res, 7: 45–57. Steel, R.G.D., J. H. Torrie and D. A. Dickey (1997). Principles and procedures of statistics: A biometrical approach. 3rd ed. McGraw-Hill, New York. Vankar, P.S. and D. Bajpai (2008). Phyto-remediation of chrome-VI of tannery effluent by Trichoderma species. Desalination, 222: 255–262. Volesky, B. (2007). Biosorption and me. Water Res., pp. 4017-4029. Volesky, B. and G. Naja (2005). Biosorption: Application Strategies. International Biohydrometallurgy Symposium, Cape Town, South Africa. 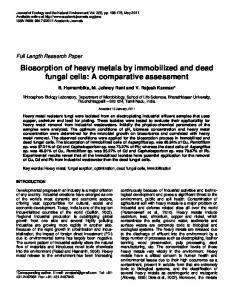 Report "Biosorption of heavy metals by pretreated biomass of Aspergillus niger"